So, the New Year is well underway and so many people I know are keen to eat healthy. I have nothing against eating a well balanced diet that incorporates healthy ingredients and cooking techniques with occasional indulgences thrown in to keep cravings in check. In fact, that is how I try to live my life everyday (with various levels of success … damn you bacon!). What I don’t like are those who think they can start a new year by eating only plain oatmeal, steamed fish, and salads. They start the year bragging about how healthy they are, but they can’t keep that kind of discipline up for longer than a week or two. Honestly, if you do this to yourself you ultimately come to know that you are setting yourself up for failure. Big time. I know, I used to fall into the ‘OMG it’s a new year and I am going to be SO healthy THIS TIME’ trap. It never works unless you embrace moderation in all things. Some foods more moderately than others, but I digress. So, with healthy resolutions in mind I went in the complete opposite direction with these bars. I am not trying to tempt you into culinary sin … or maybe I am. These bars are three layers of buttery, moist evil! The first layer, the base, is a cross between a cake and a cookie. 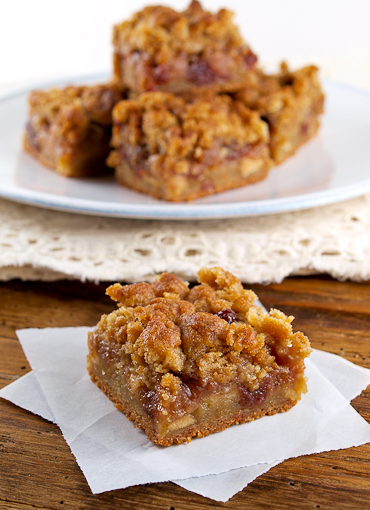 It is sturdy, yet tender, and it is the perfect canvas for the goodies on top! Next up is a layer of tender cooked apples and dried tart cherries cooked in butter and finished with a little cream. 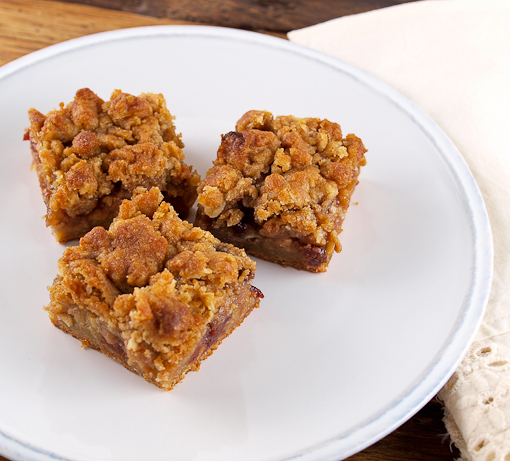 Finally, the topping is an oat crumble that tastes a lot like a cinnamon scented oatmeal cookie. 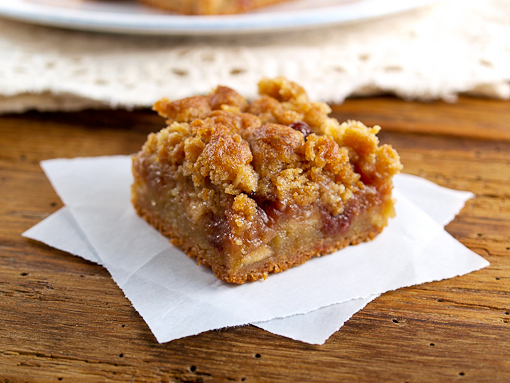 These bars are utterly irresistible, and they kind of feel like they might be a little, itty-bit healthy. 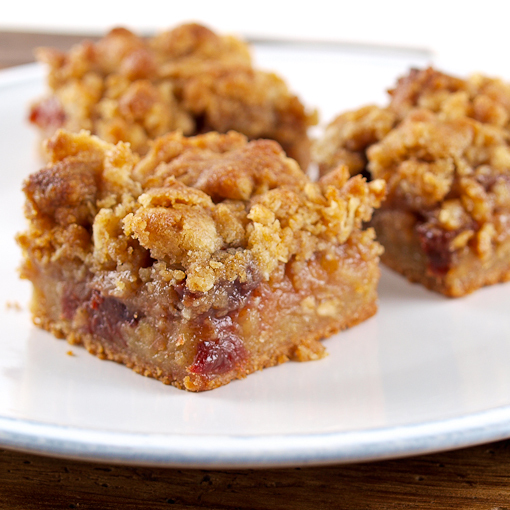 Apples and oats are healthy, and balance out the cream and butter … right? Heat the oven to 350F. 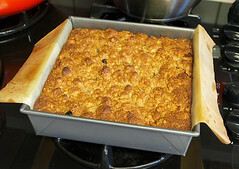 Spray an 8×8-inch square baking pan with non-stick spray. 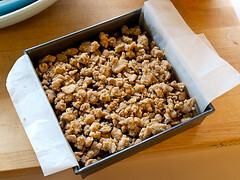 Line the pan with parchment paper, making sure there is at least a 3-inch overhang on either side to help remove the bars once they cool, then spray the paper with non-stick spray. 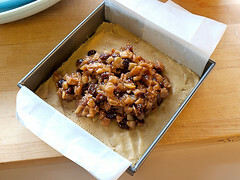 Begin by making the filling. In a medium skillet over medium heat add the butter. 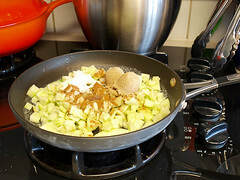 Once the butter foams add the apples, brown sugar, sugar, cinnamon, allspice, and salt. Mix well and cook until the apples are very juicy and bubbling, about 3 minutes. 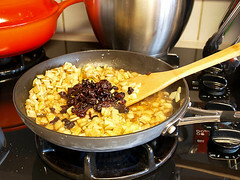 Add the dried cherries and continue to cook, stirring frequently, until the juices are very thick and the apples are tender, about 8 minutes. Once the mixture is thick reduce the heat to low. Combine the cornstarch with the water and add it to the apples. Increase the heat to medium low and cook until the mixture is very thick. 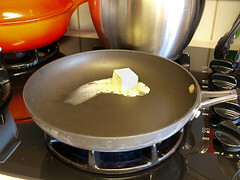 Remove the pan from the heat and add the cream. Stir to combine then set aside to cool. Next, prepare the base. 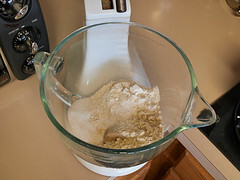 In the work bowl of a stand mixer, or in a large bowl with a hand mixer, add the sugar, brown sugar, flour, almond flour, baking soda, and salt. Whisk to evenly combine the dry ingredients. 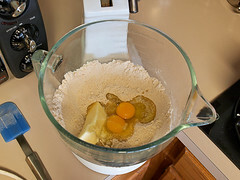 Add the butter, eggs, and vanilla and beat until the mixture forms a thick batter. Third, prepare the topping. 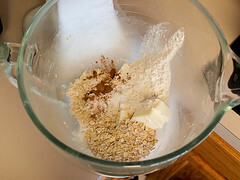 In a separate bowl combine the butter, sugar, flour, almond flour, oats, cinnamon, and baking soda. Mix, or rub together with your fingers, until the mixture is crumbly and well combined. Refrigerate this mixture for 10 minutes. To assemble begin by spreading the base evenly into the prepared pan. 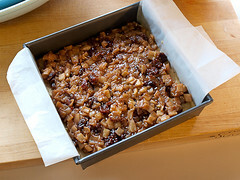 Next, spread the apple mixture evenly over the base. finally, evenly distribute the crumble over the top. Bake for 35 to 40 minutes, or until the bars are deeply golden brown on top and slightly puffed. 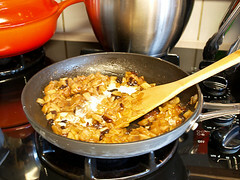 Cool completely in the pan then carefully use the parchment to remove the bars from the pan. Cut into 16 squares.